I’m still trying to get Kate to eat bread, and it’s been several weeks since I’ve offered her some so I decided to give it another shot. I stuck with peanut butter and jelly (a classic) and used a cookie cutter to cut it in the shape of a star to get her a little more interested in trying it. Just in case she wouldn’t eat it, I made sure that her two sides were things I knew she really liked and would be enough to fill her up until her afternoon snack. I’m not sure yet how it went over at daycare, but Kate was super excited about her “star sandwich” when I was making it. I’ll have to make another one for this weekend and see if my trick worked! Want to see what’s in my lunch bag? Like All Things G&D on Facebook to find out! I post weekly pictures (and links to recipes) of lunches I pack for myself during the work week. Yum! Do you buy organic and if so are there any good sites you know of for coupons for organic foods and such? We are slowly making the transition to organic in our house(fruits and veggies/milk) to start but with that I find our grocery bill getting bigger and bigger. I know the long term health benefits outweigh the short term cost but when you’re living on one income it can become a but cumbersome. Any tips on being organic for cheap(er)? Thanks! Sunbutter is a tasty alternative to peanut butter and is safe for kids with peanut or tree nut allergies! Win! @Anonymous: Kate’s daycare is pretty small and luckily no one there has a peanut allergy (yet). I can see how that could certainly be a challenge! @Anonymous: I do buy organic for Kate, but sadly I’m not familiar with any good discount sites or coupons. Are you familiar with the EWG’s Dirty Dozen and Clean 15 lists? I’d recommend committing to always buying organic when it comes to the items on the Dirty Dozen list. The Clean 15 is a list of foods you can feel more comfortable about buying non-organic to save some money. Some other tips…I buy whole organic chickens from Costco, roast them up and shred them and that’s what we use for a lot of chicken recipes. It’s much cheaper than buying organic chicken breasts. We also somewhat limit Kate’s milk intake (organic milk is expensive, as I’m sure you know). This may sound sacrilegious coming from a girl who grew up on a dairy farm, but I personally think it’s unhealthy to drink too much dairy milk. We try to stick to one sippy cup of milk/meal for Kate and after that she gets water or her green smoothie to drink. I honestly believe it’s better for her not to have more milk than that, and the secondary benefit is that it does reduce the frequency of which we have to buy expensive organic milk. Hope those couple of tips help! @Lisa: Thanks for the recommendation! Kate’s lunch bag is so cute? May I ask where you got it? Also, how do you pack her lunch in the bag? What kind of containers do you pack things in? Does the bag require an ice pack? 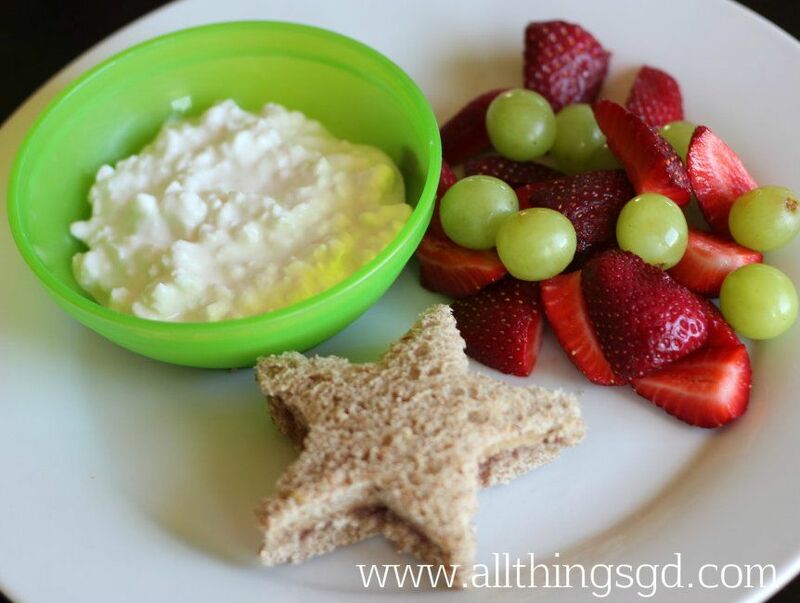 I’m always looking for an easier or more convenient way to pack my girls’ snacks and lunches. Thanks! Thank you Shelly! 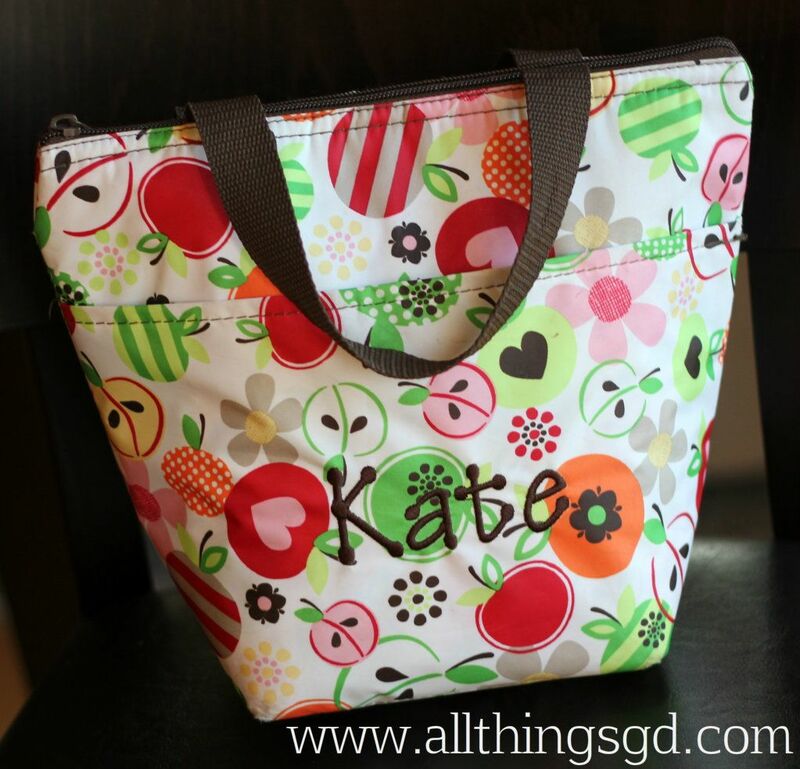 Kate’s lunch bag is from Thirty-One (www.thirtyonegifts.com). It’s a thermal bag and it goes from our fridge to the daycare’s fridge so I don’t need to use ice, but it can certainly accommodate an ice pack if one is needed. I mostly use little Take and Toss lidded bowls for packing her lunch (the green bowl in the picture above is one of those) or small glass custard cups with lids if it’s something that needs to be heated up. I just toss all the containers in her bag and go. Hope that helps! @Anonymous: That’s such a wonderful thing for you to say – thank you! I can’t get Paige to get eat bread either–unless its grilled cheese and that is even limited (sometimes she just pulls the bread apart). She isn’t into PB either–i hate packing lunch for her. She does love some ham & cheese roll ups though. @Katie C: Thank goodness there’s always something we can find that our kiddos will eat!